got anxious and drilled the rivets out of my pop out port hole flanges and removed them. I picked up a pair of Viking Marine 6" screw in port hole covers from my local Hobie dealer. I first noticed that the holes on new flanges do not match up with existing holes in deck, not a big deal. the new flanges are about 1/4" larger in diameter than the original pop out flanges, so the new flange has some overhang. is this normal? just apply more RTV? the port and starboard side of the deck opening are raised, Im afraid that when I drill new holes they will be too close to the edge of the raised area. did rotate the new flange around but could not find a happy position to drill yet. perhaps I am being to picky and looking for tolerances the do not exist, but the barrel of the new flange is smaller than the barrel of the pop out flange so centering and positioning is sloppy. I did find a position where it sits pretty flat (no high spots or rocking) but I still get the overhang on port/starboard raised sides. can I silicon the old rivet holes or do they need to be epoxied? will JB weld be okay for epoxy. I just want to put this boat in the water already. is there supposed to be a gasket or O ring? I know what you mean, hull ports were the first "fix" I did to my boat, too. I would just center it up as best you can and drill the new holes. A little overhang on the sides isn't a huge deal, but if it bothers you, you could seal/fill around the edges with 3M 4000 marine sealant. If you pick up some black pigment, you can tint the sealant to match the color of the hull/ports. I used the hull ports that Hobie sells. The new screw in type did fit a little different than the pop-in's. 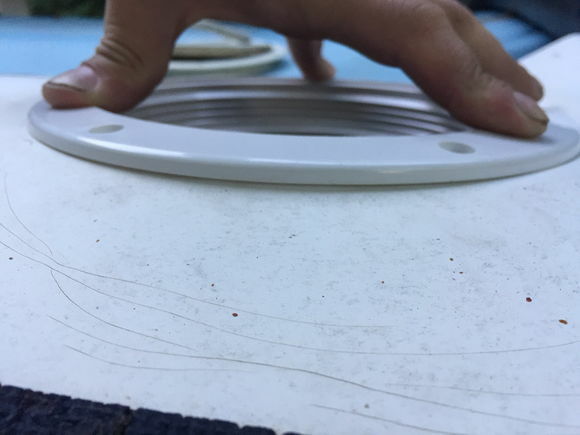 The hull flange extended just to the edges of the "flat" spot in the deck. There's no gasket under the flange. Just pump a lot of sealant down there. I've found the white marine sealant from 3m or loctite in the caulk sized tube lasts way longer than silicone. The overhang isn't bad. Sealant should fill that just fine. Otherwise some thickened resin would fill that too. Are the Hobie ports and the viking ports identical, same part? there is an O ring, its clear and in the top of the flange. noticed it when installing flanges. install was pretty easy, had no idea the deck is so thin, drilled new bolt holes instantly. Used a little extra silicon to create a gasket inside the port hole as the hole is maybe 1/2" larger than the barrel of the flange. hopefully they don't leak. test them tomorrow. I've seen new screw hatches at a hobie dealer and they were Viking. All the ones I've got to replace old hatches on my boat were Viking so yea they work. 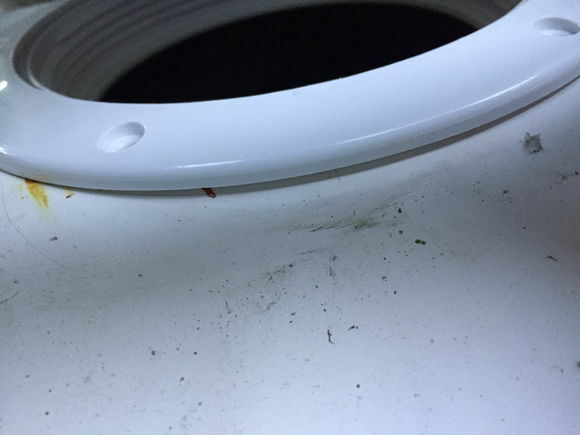 Did you find the need to reinforce the fibreglass under the lip of the holes? the screw in flanges actually feel like they stiffened up the deck a little bit. I used a lot of epoxy to fill the factory bolt holes and under the lip. There is some surface cracking in this area and its a little flex. I am planning to do some glass repair to the bow in the fall and will most likely add some glass under here as well. I used two layers of 3/4 oz mat laminated to the underside of the deck to stiffen up the porthole area. It made a substantial improvement in the stiffness of this area. 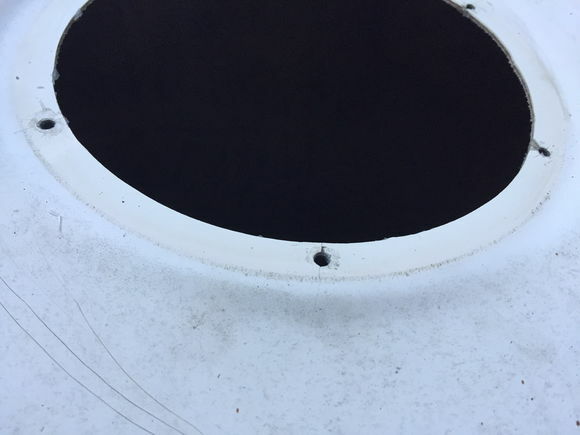 If you notice in the first post there are semi-circular cracks around the outside of the port opening. These are an indicator that the deck has flexed around the port. Most likely this is from the original pop-in ports putting stress on the deck. This may be too late for the OP, but before you dive in to replacing the entire porthole assembly, see if you can improve the sealing just by lubricating the threads on the cover and flange. I recently had a porthole on my H17 that was not threading on easily and was spewing bubbles during a leak test. I put a thin coating of bearing grease on the threads and the cover tightened down easily with almost no bubbles forming on the subsequent leak test. This was a heck of a lot less work than removing and replacing the entire porthole assembly. Good one Steve. I have had (temporary) success using plumber's Teflon tape.